I have one of the best jobs in the whole world! This is because I get to go out on gold mining adventures with enthusiastic people! We have a lot of fun on these weekend projects. I get to meet very interesting people. And we always find enough gold to make everyone happy! This particular project involved around 50 people, many of them beginners who joined with us for the weekend to get some first-hand experience. I am also lucky that there are always several experienced New 49’er members who enjoy coming out to help me manage these group mining programs. I could not do it alone. As far as I know, we are the only mining association in the world which makes this service available to others. We always start with a few hours of theory on Saturday morning to lay out the foundations of how gold forms deposits in the waterways, and alongside of the waterways. Then we discuss how to follow an organized sampling plan to locate high-grade gold deposits. This is an opportunity for beginners to learn the most important basics, and everyone else to get their questions answered about how to find gold. I’m not talking about finding just a little gold or a few specks. I’m talking about finding enough gold to fill bottles! 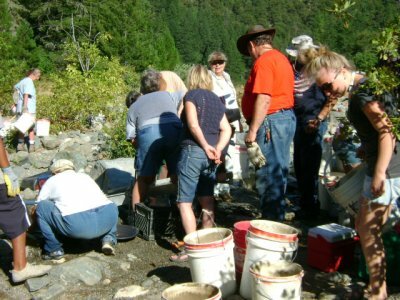 After lunch on Saturday afternoon, we meet up at our office in Happy Camp and all go out together to sample on one of our many gold properties along the Klamath River near Happy Camp, in northern California. Because the property has produced so consistently well for these projects during the past several years, on this project, we all went out to our property at K-15A. This property is called the “Mega Hole” for very good reason! K-15A is quite a large property. It begins a little ways downstream from Fort Goff, and extends several miles downstream to where it meets up with our “Glory Hole” property at K-15. The Glory Hole, which is another great gold-producer, then extends another mile or so down to the mouth of Tims Creek. The whole 3-mile stretch has been making New 49’er members happy all the way back to the summer of 1986. But we only discovered the rich surface deposits towards the upper-end of K-15A a few years ago. That’s the thing about having over 60 miles of gold-bearing waterway (120 miles if you count both sides of the river). New strikes are being made by our members all the time. Once someone makes an initial strike, word gets around pretty fast, and other members move into the area. Then they make additional strikes, often even better than the first. This creates quite a lot of excitement. 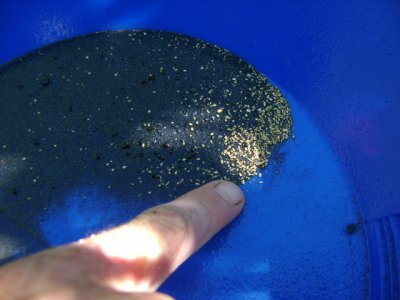 Over the years, we have experienced a bunch of small gold rushes involving hundreds of people. It is always interesting, and sometimes there is a bunch of drama that plays out just like in the movies! As far as I know, long time member, Otto Gaither, was the member who made the first strike on the upper-end of K-15A. Since then, we have had thousands of members (not all at once) out there on that huge bar working the shallow deposits. So, a lot of work has been done, and a lot of gold has come off the bar. Still, I think it is fair to say that much less than half of the surface gold deposits along the bar have yet to be mined. Our organization has surface mining guidelines (rules) that require members to fill your excavations in behind you as you do your mining, and to completely fill in your holes when you are finished. This leaves the bar looking pretty-much the same as it was when we first got there. 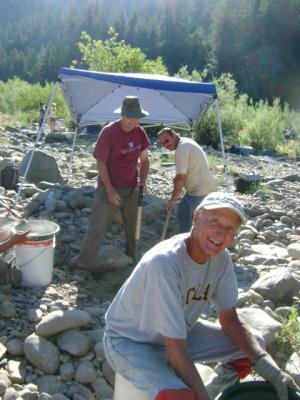 The gold deposits on this particular bar exist mostly in less than 18 inches of streambed material. So backfilling your excavation is really easy to do. It is not difficult for an experienced eye to tell the difference between an area that has been backfilled, and an area which has not been mined, yet. This is all about what “hard-pack” is. Hard-pack is streambed material which has been formed by a major flood storm. Hard-pack consists of rocks, sand and gravel that have all been compacted into place by the forces of nature. The material actually flowed there like a slurry during a single (huge) storm event; and then formed with interlocking rocks and other material as the storm-forces tapered off. 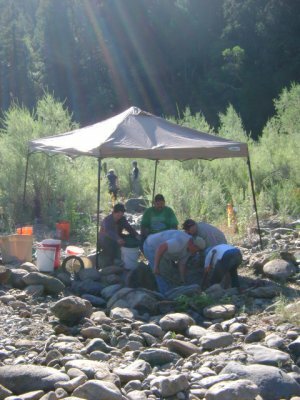 Since gold is about 6 times heavier than the average rocks, sand and gravel that make up a storm layer, high-grade gold deposits are nearly always found along the bottom-surface of a hard-packed streambed layer. We discussed this very important principle in great detail on Saturday morning. Then, once we were all together out on K-15A on Saturday afternoon, I walked everyone around and showed them the difference between the areas which had already been backfilled, and the areas which had not been mined, yet. The places that have not been mined still have hard-pack resting directly on the surface of the bar. Sometimes, earlier miners have piled rocks or tailings on top of un-worked areas. It is not hard to find the un-worked areas once you know what you are looking for. During these weekend projects, we always have two objectives on Saturday afternoon. The first is to make sure that everyone out there knows how to use a gold pan efficiently. 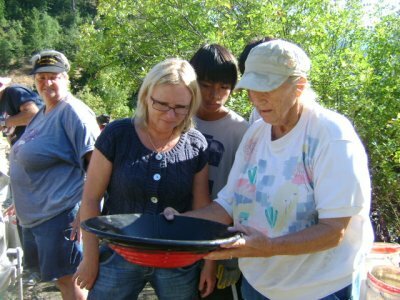 Fortunately, we have a bunch of experienced members out there who are willing to help beginners learn gold panning. 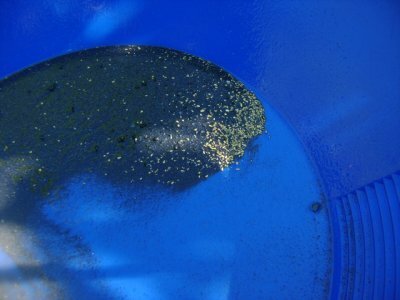 Gold panning is not difficult. But sometimes it takes a little practice to get your arms doing the motions correctly. You have to know how to gold pan without losing gold, or you cannot sample properly. Therefore, we place quite a lot of importance to this. 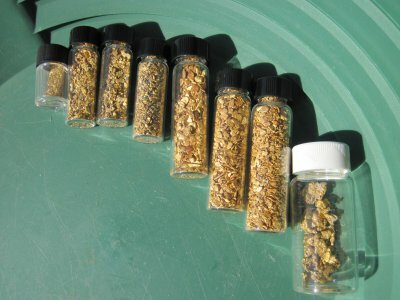 One of the most important things participants gain on these projects is the ability to relate the amount of gold found in a good pan-sample to how much gold you can recover once you get into production! The second objective is to locate enough high-grade material to sustain three or four hours of productive work for our whole crew on the following day. In this case, it was going to be around 50 people feeding three high-bankers. So, after demonstrating what we were looking for, we set the whole group free to find it. And it did not take long before they started turning up good gold in their pans! We have discovered from extensive experience that the entire upper bar on K-15A pays at the bottom of a rather thin layer (average less than 18-inches) of hard-pack. The surface layer of hard-pack is usually sitting right on top of a distinctly-different layer of dark brown material. In some places, the brown layer is soft, and in other areas it is very compacted. Either way, the gold we were looking for sits right on top of the brown layer. In all the years we have been doing this, Richard Krimm is the only helper I have ever seen with so much enthusiasm that he carries 4 buckets of pay-dirt at a time! But, some places are higher-grade than others, so my experienced helpers and I devoted most of the afternoon to identify patches of hard-pack which seemed to pay the most. Then we set up the three high-bankers strategically so that buckets of pay-dirt would not need to be carried any further than necessary on the following day. While we were doing that, there were hoops and hollers coming from some of the participants who were finding good gold through their sampling efforts. We do a group potluck at 6:30 on Saturday evening, so I personally try to get off the bar by about 4:30 in the afternoon. Some of the participants were finding their first gold out there. So there were a bunch of participants still hard at it when I returned to Happy Camp. We had a full house at potluck on Saturday evening, as we usually do these days. Nearly everyone contributes something to the meal, so the tables were overflowing with delicious dishes, side dishes, deserts, and there must have been six large pizzas from the local pizza house. Besides the meal, potlucks are a great opportunity to meet other members and gather important information about new gold strikes happening on the Club’s properties. Everyone was having a great time! We like to get started early on Sunday morning so that we can get the hard work completed before the heat of the day beats down on the bar. We usually have people out there as early as 6:30 on Sunday morning. Production is in full swing by 7 AM. This was a nice, cool morning, good for gold mining work! The participants set up a bunch of shade structures out there so they could work out of the sun. This was a smart idea! One of the interesting trends I have been watching over the past few seasons as gold prices continue to go up and up (and up), is that we are getting more and more interest from a younger generation of gold prospectors. This is a really good development, since someone is going to have to take over the long tradition of small-scale gold mining in America from us old-timers when we get too tired to do it anymore! This particular event included a sizable family of new prospectors from the Netherlands, which included three gorgeous young ladies that were overflowing with enthusiasm. Gorgeous young women are something that is entirely new to these weekend projects, so I did my personal best to try and keep my main focus on the gold, and not the girls. I admit that it was not easy! I was notthe only single guy out there struggling with this challenge! Anyway, as long as we can continue to manage these difficult situations, we can only hope that the upward trend in gold prices will continue to attract more and more interesting people into our program. See for yourself in the following video sequence. Wow! We do not normally shut everything down and take lunch on Sunday. Everyone is instructed to just take a break whenever you need one. This includes stopping for some nourishment whenever you are ready. In this way, the high-bankers usually keep processing without interruption until the pumps run out of fuel. Showing participants how much gold we are recovering goes a long way to keep everyone motivated! 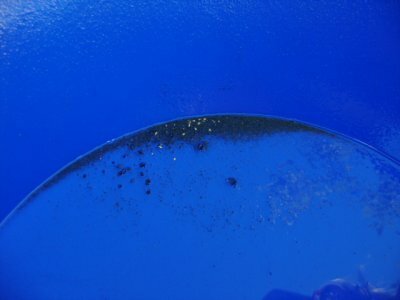 Here is the gold that was removed from the high-grade section of one of the high-bankers at mid-day. The gold was adding up good, and everyone was getting pretty excited! There were cheers all around as team leaders picked a bunch of beautiful gold nuggets off the top of the 8-mesh screens. Diane was standing right there with a special container that she keeps handy just for this to make certain the nuggets do not get lost. She also takes control of the final concentrate to make sure it arrives safely back in Happy Camp where we work it all down to just the gold. After stowing all our gear, and double-checking the bar to make sure we were not leaving any litter behind, we gave everyone an hour break with a plan to meet back in Happy Camp to do the final clean-up and gold-split. 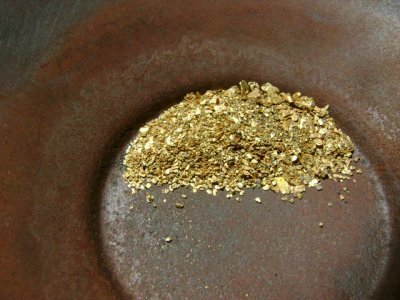 Here is the gold we recovered before we split it up! This is not one of those programs where we go into a back room and return with a share for everyone. All participants on these projects are invited to participate in, and watch, all of our final clean-up steps once we return to Happy Camp. In fact, I rely on the help of about a dozen participants to move the process along as quickly as possible. Our objective to send everyone away with a complete A-to-Z working knowledge of how to sample for and locate high-grade gold deposits, how to develop the deposits for optimum returns, what the rules are about how to do it without getting yourself into trouble with the authorities, and how to clean-up the final product so that all that remains is beautiful gold on the scale when you weigh it out. In all, we recovered 14 pennyweights of gold (just under ¾-ounce) in about four hours of hard work. This included 26 nuggets, the largest which weighed 6.82 grains. We drew chips on the nuggets, but all participants went away with an equal share of gold by weight, everyone with a nice smile. That’s just the way I like it! Gold Jumped in Value by 40% During 2010! “People are disenchanted with paper currencies. They want to own something real, and over centuries gold has proven to be real,” Mr. Wien said. How about this:silver jumped in value by 82% during 2010! 4-inch Keene Dredge: Van Wilhite; Back pack high-banker: Peter P Ackerman; Louie’s Welding sluice: High Desert Treasure Club; Espey display case: Dennis L Scharosch; Espey display case: Bill Lant; Treasure Mate Pin-pointer: Raul Molinar; IST full wet-suit with hood: Keith McRobert; IST shorty wet-suit with mask: Welsey Wright; Gold N Sand hand pump: Ron Oliver; Display gold case by Wray’s: John R Menegay; Garrett gold panning kit: Gregory Page; Garrett gold panning kit: Gerard A Welch; Buck A Billy sluice by Tom Chambers: David L Brand. Each of the following people won a quarter ounce of gold: Steve & Kathy Eastman, Jim Hunt, Larry E Carter and John R Menegay. Each of the following people won 1-pennyweight of gold: Rusty Garrison, John McGrath, Jill H. Wallace, Dave Dunn, NAMPA GPAA, Phil Bernhardt, James Blessing, Louis Santoro, Larry E Carter, Larry Sohler, Jon Kruck, Howard F. Becker, Kenneth Payne, Marvin E. Duincan, Jim Carson, Roger Austin, Monty Nielsen, Martin S. Kowal, Phil Osborn and Allen Stuart. Congratulations to all of our winners! Our office will be taking steps to confirm addresses before sending prizes out. I want to thank everyone very much who contributed to this effort! Our legal fund is presently in the plus-zone, a situation which I do not often have the pleasure of reporting to you guys! Still, we are faced with issues that are already on our radar screen. With that in mind, we will be working to pull a new fund-raiser together in time for our February mailing. The next drawing will be for three ounces of beautiful Rogue River gold that I have already set aside just for this. Any and all contributions that we receive from now forward will automatically generate prize tickets for the next drawing. Important note: Our original December Newsletter announced a meeting schedule that the California Department of Fish & Game (DFG) was planning, so they could receive public input to their proposed new suction dredge regulations (which are not available for viewing, yet). Since then, we have been informed by DFG that they are running behind schedule. So they have canceled the meetings that we announced in our December newsletter. We will put out another update once DFG sets a new meeting-schedule. We have not yet seen any of what DFG will propose for our new regulations. But based upon the way they have been doing things over the last several years, there is plenty of reason to suspect that we might not be happy with everything that they propose. Personally, I doubt that California’s Administrative agencies have listened to any of the voters’ message in November that we want less government spending and regulation. So we should be prepared do go in and give them an earful during these meetings when they actually do happen. The DFG schedule for completion and adoption of our new suction dredge regulations in California is now so late, that I suggest it would be unwise to expect dredging will be allowed in California in time for the 2011 season. Is anyone surprised? Dredging is Allowed in Oregon! 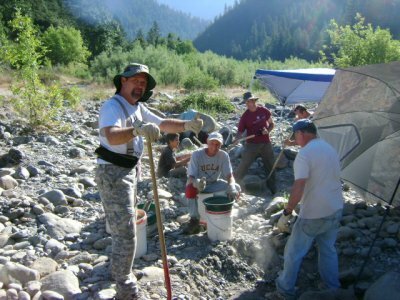 For those of you who want to plan your vacation or summer season doing some suction dredging, I strongly suggest that you consider the upper Rogue River in Southern Oregon. We had a number of members over there last season (including myself, Alan Mash, Craig Colt, Jim Yerby and many others) that were very happy with the River. 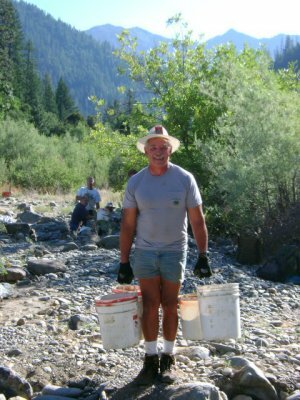 For anyone who suspects that I am the only one who ever gets into the high-grade gold deposits, here is a testimonial from Alan Mash on how he did last season while dredging along the Rogue River. Alan is not a commercial gold dredger, even if he does work hard at it. I think you might find his story pretty interesting! Our office has a published map which provides direction to the thirty or so public access points to about 30-miles of Rogue River that is open to all our members just over the border in Southern Oregon. 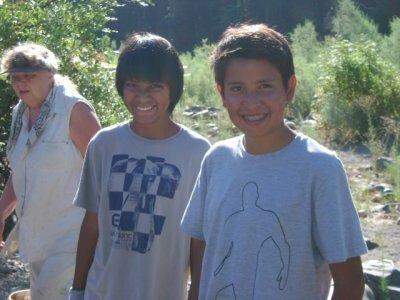 Since free camping is nearly impossible to find along the upper Rogue River, there is also a list which includes most of the private and public (fee) campgrounds. The annual dredging permit in Oregon is only $25. Let me just say that the upper Rogue River area is absolutely wonderful! The main difference between the Rogue and Klamath Rivers, is that the Rogue has mostly-shallow gravel deposits to the pay-dirt. I did not see a single place last season where gravel depth was more than three feet. The place where Craig Colt and I dredged over a pound of gold only had one foot of material over the pay-dirt. Many other members experienced the same thing. Shallow streambed material allows sampling and mining go faster. The Rogue is a good dredging river! 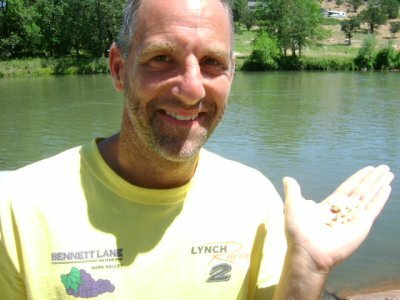 As long as our staff is able to manage things alright along our properties in California, I intend to devote most of the upcoming summer season sampling and working with members along the Rogue River in Southern Oregon. You can plan on it! Sign up for the Free Internet Version of this Newsletter! We strongly encourage you to sign up for the free on line version of this newsletter. Signing up is easy. Just click on this link. Then confirm your free subscription when you are sent an email. You can just as easily opt off the service by clicking a different link if you decide you don’t want to receive this free service anymore. Nice Mining Claims for Sale! 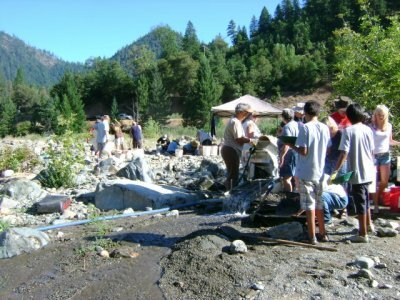 By the way, for anyone looking to buy your own mining property along the Klamath River or in southern Oregon, please check out what Jason Inks has to offer right here.